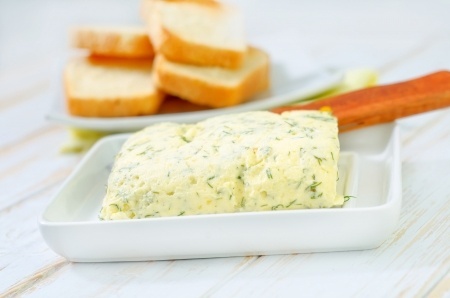 Garlic butter is quick and easy to make at home and adds great flavour to many dishes. This recipe for garlic butter, also known as beurre à la bourguignonne (Wikipedia), shows you just how easy it is to make. Place in a fridge to firm and use as required. If you have any butter left over, roll it into a small sausage shape, cover with cling film and twist each end to make a good seal. Label and date and put in the fridge or freezer for use at a later date. Garlic butter is best served in small cups and can be served with seafood.